Usain Bolt beat America's Justin Gatlin by a hundredth of a second with a time of 9.79 seconds. 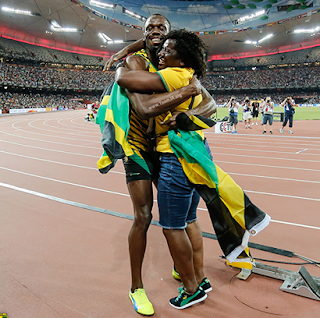 The Jamaican sprinter has won nine World Championships and six Olympic gold medal. The former did not go down today at the World Athletic Championships in Beijing, but the latter did as American Justin Gatlin lost for the first time in his last 29 races. The victor was none other than the only sprinter most of us can name off the top of our heads (and a guy we usually only hear about for a few weeks during every fourth summer): Usain Bolt. It was the first time in roughly two years that Bolt and Gatlin had raced against one another, which we're sure at least partially explains Gatlin's winning streak. Bolt won today's race with a time that would've rivaled a Model T, 9.79 seconds, a whole .01 seconds quicker than Gatlin, to reclaim what is possibly the coolest title anyone on the planet can stake a claim to: The Fastest Man on Earth.